Pianoteq is the result of an academic research and results in what we call the fourth piano generation. This is the very first, and only, piano available that belongs to this generation. Pianoteq is the first and only piano belonging to the fourth generation, developed in order to go beyond the limitations of the third generation and to become a versatile and innovating tool. It is in fact the first virtual piano factory — it can produce new brands as well as copies of historical instruments. - The piano sound is constructed in real time, responding to how the pianist strikes the keys and interacts with the pedals. - It includes the entire complexity of a real piano (hammers, strings, duplex scale, pedals, cabinet). - No quantization noise (32-bit internal sampling at 48 KHz). - Real progressive variation of the timbre (127 velocities per note). - Adjustable hammer hardness (voicing) and other similar parameters. - Adjustable unison width (tuning) and other similar parameters. 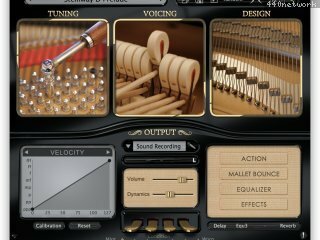 - Adjustable piano size (soundboard) and other similar parameters. - Adjustable spectrum profile, based on the first 8 overtones. - Progressive sustain pedal, allowing partial-pedal effects. - Sostenuto pedal, harmonic pedal and Una Corda (soft) pedal. - Very fast to install and initialize. - Total size is just 8 MB (MegaBytes). - It can be used successfully with a laptop (low hardware requirements). - Adjustable optional samples of acoustic noises (pedal and key release). - Built-in graphic equalizer with freely adjustable key points. - Built-in graphic velocity curve with keyboard presets. - Built-in reverb unit with presets. The interface tooltips have been translated to french. The Rhody R1 has been replaced by its successor, the Rhody R2. New parameter for Rhody: tines sound. * Key range of K1, C3 and M3 grand piano extended to 105 keys. * Keyboard transposition can be controlled with the computer keyboard, or custom MIDI mappings. 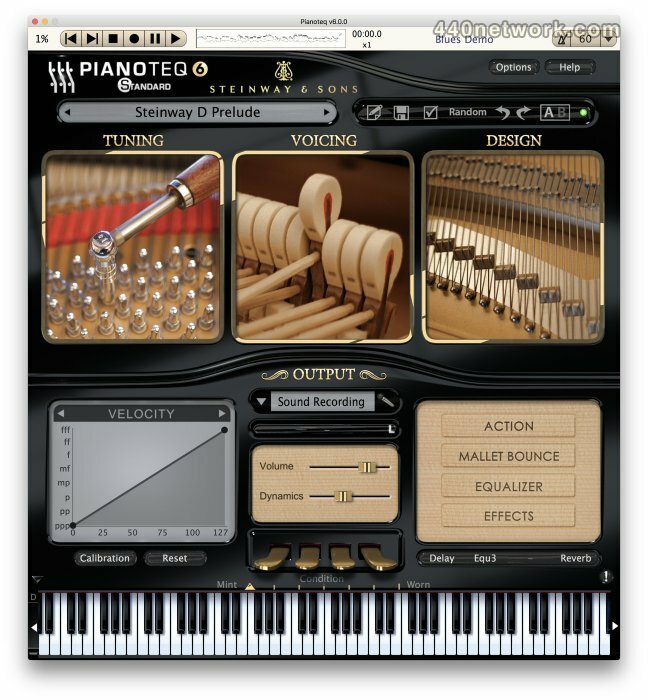 * Pianoteq Standalone now recalls both A and B presets on startup. * (2010/10/25) fixed issue with Gamelan.fxp. * (2010/10/25) fixed activation issue on windows. * New Xylo add-on, featuring Xylophone & Bass Marimba. * Added drag and drop for microtonal Scala files on the Pianoteq interface. * Introducing the Celesta and Glockenspiel instruments. * Added a humanize option to the Strike Position slider (right click on the slider). * The Mac version now includes a 64-bit version of the standalone application and the Audio-Unit plugin. * The preset menu was reorganized. * Fixed issue with multi-channel pitch-bend messages when used for microtuning purposes (with devices such as http://www.h-pi.com/ ). * New K1 Grand Piano instrument. * User selectable folder for user presets and add-ons. * The default MIDI file for the standalone version can now be changed. * Jack MIDI support for the Linux version. * Increased the filter sweep speed for the wah-wah effect. * Minor bugfixes and features. * Updated engine and interface for the new Clavinet add-on. * New "Mute" parameter in the actions panel. * Added a Wah-Wah effect section. * 29400Hz is now available as an internal sample rate in the options/perf panel (provides excellent sound quality with lower cpu usage). * Improved the audio load curve, and added a warning in the options/perf panel for suboptimal buffer sizes. * Various optimizations for netbooks, Pianoteq 3.5.3 runs smoothly on an atom N280 netbook when using an internal sample rate of 29400Hz. * Updated engine for the new Cimbalom add-on. * Fixed VST-specific bug when loading old projects or FXB files in the VST plugin. * Fixed crash when loading some custom keyboard mappings. * Slightly improved performance of multicore-rendering on windows. * Minor adjustement of the damper model. KIViR.ptq also updated. * Engine upgrade, with improved resonances, for all instruments. * C3 and M3 pianos have been revoiced, and their soundboard replaced. * Small improvements on the electric pianos, a new preset R1 Bark has been introduced. * The KIViR historical instruments have been updated (small improvements). * Note Edit for DETUNE and VOLUME in Pianoteq Standard. * Note Edit for other parameters in PRO version. * Note Edit, Sound Recording, and Preset Manager window can be detached from the main interface. * Added a note-off velocity curve, and a sustain pedal position curve. * New parameters available for most instruments: (hammer) Strike Point, and Damper Position. * Adjustable playback speed for the standalone midi player, adjustable volume for the metronome. * The compare button has been replaced by an A/B button, for switching between two presets. * Pitch bend range extended to +- 2400 cents. * Native Linux (x86) version now available, with Jack and ALSA backends. * Auxiliary output buses available for the AudioUnit version. * (2009/05/18) A few fixes for the Linux version. Fixed bug with MIDI mapping presets (saving / loading / etc.). This update offers a 'flat' temperament that supports tuning of certain synthesizers with octaves having exact ratio 2. An additional stretching can be used for fine tuning. Ce soft est très bon et peu gourmand. Paradoxalement, je le préfère pour ses add-ons, en particulier les rhodes,clavinet. et les nombreux réglages, le son conserve une certaine acidité et manque un peu de présence. Selon moi, Pianoteq, pour le piano, convient plus pour des pièces «intimistes» que des morceaux où il faut marteler. Quant à la jouabilité, dans cette «gamme» de prix, c'est le meilleur! J'apprécierais plusieurs add-ons de piano préparés. Là il y a du vaste terrain pour Moddart pour ajouter des développements. Je suppose qu'ils doivent y ajouter des formes d'ondes, car il est impossible de créer des instruments plus récents (qui faisaient partie des rajouts ultérieurs) simplement avec des modifications de paramètres existants). Donc messiers, jettez un coup d'oreille sur les enregistrement connus de Cage, voir des autres compositeurs contemporains qui ont oeuvré pour le piano préparé (et pas seulement désaccordé), et essayez de nous cuisiner quelques élements peu usités (comme un sceau de balles de ping-pong versés dans un piano grand queue, qu'avait fait Nicolas Frize - compositeur et facteur expérimental - http://ma-tvideo.france2.fr/video/iLyROoafIS9G.html). Je pense que Pianoteq a encore plein de possibilités devant lui... en allant dans de nouvelles et inhabituelles directions. La version 3 est quasi parfaite, je viens de lui adjoindre l'add-on YC5, qui a LE son qu'on retrouve sur toutes les grosses productions. Et quel bonheur de travailler sur la base d'un modèle pour le re-fabriquer à ssa façon, un véritable outil de sound design. Incomparable selon moi, et il n'y a toujours pas de concurrence !! Belle avance de prise pour Modartt. Et voilà, la version 2.0 est arrivée hier, et c'est une évolution très intéressante. Un nouveau modèle de piano "Grand C2" dont les aigus sont encore plus réalistes, les médiums plus riches. Une application indépendante "stand alone" avec possibilité d'enregistrer directement, sans l'artillerie lourde d'un séquenceur. Toutes sortes de tempéraments et accords désaccords possibles et paramétrables. Je n'ai presque rien exploré des nouvelles possibilités, et je suis déjà conquis. Tellement bon qu'ils modélisent les anciens pianoforte de musée ! Quand on voit la qualité extraordinaire de PianoTeq seulement en version 1.0, on se demande : jusqu'où pourront-"ils" aller ?